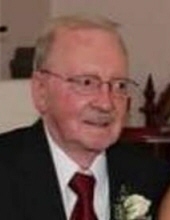 Saint Albans – Richard C. Pryme, a lifelong area resident passed away Wednesday, March 13, 2019, at his home with his loving family at his side. Born in Highgate on May 27, 1929, he was the son of the late William J. and Gladys (Rice) Pryme. Richard was 89 years old. Richard married his childhood sweetheart, Doris Bouthillier, on November 7, 1953, in Sheldon Springs. Richard was a 1947 graduate of Bellows Free Academy. In 1951, he joined the U.S. Army and fought in the Korean War. He received his Honorable Discharge on March 16, 1953. He retired from Boise Cascade in 1987. He was a longtime member of Sheldon Springs American Legion Post # 88. Richard is survived by his wife of 65 years, Doris, of St. Albans; son, Gregory Pryme and his wife, Rose, of Highgate; daughter, Janice Gagne and her husband, Lionel, of Georgia, as well as his grandchildren, Sara Schmidt and her husband, Thomas, and their children, Grace, Caleb, and Finn, of Haverhill, Massachusetts; Emily Chadwick and her husband, Trevor, and their children, Emmitt and Ty of Milton, Vermont; Gregory Pryme, Jr. in the U.S. Air Force, stationed in Korea; Brian Bourbeau and his wife, Lindsey, and their children, Myles and Charlotte of Georgia, Vermont and Shawn Bourbeau and his wife, Maria, of Declo, Idaho. In addition to his parents, Richard was pre-deceased by his brother, Furman Pryme. Private graveside services will take place at a later date in Saint Anthony’s Catholic Cemetery in Sheldon Springs. Assisting the Pryme family is the Heald Funeral Home of Saint Albans. To plant a tree in memory of Richard C. Pryme, please visit our Tribute Store. "Email Address" would like to share the life celebration of Richard C. Pryme. Click on the "link" to go to share a favorite memory or leave a condolence message for the family.